The D3000 and D4000 computer-to-analog output interfaces are designed to be mounted remotely from a host computer and communicate with standard RS-232 and RS-485 serial ports. Simple ASCII commands are used to control a 12-bit digital-to-analog converter that is scaled to provide commonly used current and voltage ranges. An on-board microprocessor provides the communications interface and many intelligent analog output functions. These modules offer an extremely flexible, easy-to-use, and cost-effective approach to data acquisition. The D3000 and D4000 are compatible with the OMEGABUS ® D1000 and D2000 and may be used in any combination. Up to 124 modules may be strung on one set of wires. All modules are supplied with screw terminal plug connectors and captive mounting hardware. The connectors allow system expansion, reconfiguration, or repair without disturbing field wiring. Their small size allows them to be mounted in virtually any location or position including explosion-proof housings and DIN rails. Utility software (D1000-SW) is available upon request at no charge on an IBM-compatible disk. The D4000 modules offer several additional features. A slew rate may be programmed, which causes the output to ramp at an adjustable rate in either an increasing or decreasing direction. The ramp can be initiated and maintained by commands from the computer or with external switch closures to the module. The D4000 module provides a readback feature which allows the computer to verify the integrity of the output. The D4000 modules also include a watchdog timer circuit that can be set such that if the computer fails to communicate with the module after a preset time period, the module will reset itself to an adjustable default value. This feature minimizes the risks of communication failure. The A1000 RS-232 to RS-485 converter and repeater can be used if an RS-485 port is not available in your PC, and it is necessary to communicate long distances away. The A1000 also provides power for the modules. 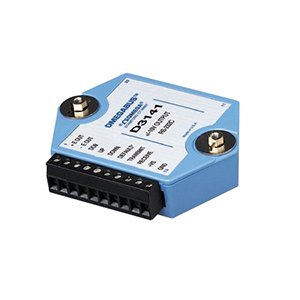 RS-232 modules can be used for distances less than 50 feet.